RMJM has been appointed to design the new Gazprom Group headquarters and business centre in St Petersburg. The $3billion project will transform a 17-hectare brownfield site at Lakhta, on the outskirts of the city, into a pioneering environmentally-friendly development that will meet the highest standards of sustainability and energy efficiency. RMJM was chosen for its proven track record for delivering landmark low energy projects and its expertise in masterplanning and tall building design. Led by Tony Kettle, International Design Principal at RMJM’s European Studio in Edinburgh, and drawing on the talents of RMJM’s St Petersburg practice, the centrepiece of the project will be one of Europe’s tallest towers, housing Gazprom’s new headquarters. One of the options being considered is a 426m tower. The 330,000m² complex will also include commercial office space as well as retail, leisure and residential developments. Gazprom and the international architectural practice have forged a strong relationship over the past five years since RMJM was first appointed to design its new headquarters, originally proposed for the Okhta district of St Petersburg. Kettle and his team have spent more than three months revising their original design to create an iconic building and masterplan that will revitalise an area of former industrial land 12kms from the city centre on the coast of the Gulf of Finland. The proposed Okhta development, which was to feature a 396m tower, was ranked among the 10 most environmentally-friendly skyscrapers by Consumer Energy Report. The new headquarters are expected to deliver equal, if not greater, energy efficiency. The masterplan design for Lakhta Business Centre draws upon the landscape around St Petersburg as inspiration, including the historical landscapes of Peterhof and Tsarskoe Selo at Pushkin. Both 18th century palaces are set within extensive landscaped grounds famed for their fabulous water gardens, cascades and fountains. The Lakhta development is located on a brownfield site consisting partially of reclaimed land, used for the industrial storage of sand. Combining a tower and a 300m long base structure, the complex will create a balanced, organic composition inspired by the movement and energy of water, the natural element that led to the foundation of the city of St Petersburg. The Lakhta Centre tower will feature a pioneering ‘intelligent’ double outer skin which will minimise heat loss during the extreme Russian winters and deliver energy savings of 50% on buildings constructed using conventional technology. The Lakhta complex will also feature a state-of-the art mechanical, electrical and plumbing system that minimises energy and water usage and reduces carbon dioxide emissions. Energy-saving design features will be incorporated throughout the masterplan and sustainability will be enhanced through the use of light rail and water transport. In addition, the new design is sympathetic to the local environment and will create an urban development ideally suited to business, residential and leisure use. The design stage of the project will be completed in 2012 and the first phase of construction will be funded by Gazprom Group. Investment for further phases of the project will be shared between the Gazprom Group and private investors. It is hoped that the complex will provide a blueprint for future sustainable design across Russia. Tony Kettle said: “We are delighted that Gazprom has chosen RMJM to develop such an iconic and pioneering project that promises to revitalise a brownfield site on the outskirts of St Petersburg and attract a huge amount of new investment to the city. “The tower design is the natural evolution of the RMJM concept previously proposed for the Okhta site, a design inspired entirely by the city of St Petersburg with its baroque architecture and water filled canals, with the changing form of water to ice, from soft organic freeform to angular crystaline geometry. Gazprom Neft has applied for planning permission to build its tower – Okhta centre – on the outskirts of St Petersburg. The Okhta tower looks set to relocate its position away from the St Petersburg skyline to the Lakhta area of the Primorsky district, on the shores of the Gulf of Finland. Gazprom Neft has rejected several sites proposed by the St Petersburg authorities. The new Gazprom HQ location is outwith the St Petersburg preservation zone. Europe’s tallest tower proposal may not be designed by RMJM Architects according to reports. The Okhta centre project is reported to cost a stunning 60 billion roubles ($2.1 billion). Gazprom said it has been cleared by Russian authorities to build a tower in the historic heart of St Petersburg despite a wide campaign to defend the unique skyline of Russia’s second-biggest city. Construction on the Gazprom headquarters is expected to begin in spring 2011 and finish in 2016, a Reuters report stated. “According to a conclusion by GlavGosExperetiza (the Russian state appraisals department), the project’s documentation complies with all requirements and standards,” a Gazprom unit in charge of the construction said in a statement. UNESCO have warned Russia it could exclude St Petersburg from its list of world heritage sites if the tower is built, so it will be interesting to hear their response. e-architect hope to post any feedback here as soon as it happens. Russian president Dmitry Medvedev has written a letter to St Petersburg officials warning them to take cogniscance of UNESCO’s concerns over the Okhta Tower designed by RMJM. UNESCO (United Nations cultural organisation) have advised St Petersburg may lose its World Heritage Status and protests against the proposal have been vigorous, especially its 403m height. The city is due to be placed on their danger list next month. Curiously Dmitry Medvedev was formerly a member of the Gazprom board. The Russian Ministry of Culture is asking that alternative designs be drawn up by RMJM. 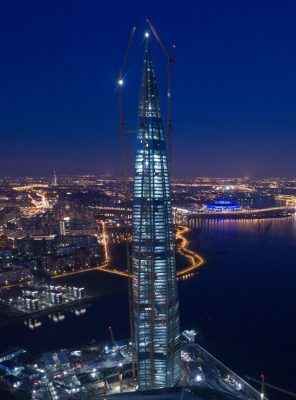 The tower will change color up to 10 times per day, depending on the position of the sun, 300m tall twisting glass tower over 75 floors already nicknamed “corn on the cob” 041206. Gazprom headquarters winner – decision re winning architect was announced 1 Dec. The shortlist was a who’s who of international architecture: Massimiliano Fuksas, Herzog & de Meuron, Rem Koolhaas, Daniel Libeskind, Jean Nouvel, RMJM Architects. UK-based international architectural firm RMJM has been appointed to design the new headquarters of one of the world’s largest companies – Russian gas giant Gazprom. RMJM’s winning proposal is a 396 metre high twisting, glass needle which echoes the spires across the city of St Petersburg. RMJM beat off 5 other internationally-renowned architects for the commission to develop proposals for the tower in the historic heart of the city, close to the Bolsheokhtinsky Bridge and Smolny Cathedral. Tony Kettle, UK Managing Director of RMJM and lead architect on the project, commented: “Winning the prestigious commission to design Gazprom’s new headquarter building in St Petersburg is wonderful news for RMJM. There has been much debate and opposition to introducing a building of this height to St Petersburg, but when you consider Paris, a city with an equally precious environment, it has been made even more special by the 324 metre high Eiffel Tower. The inspiration for the RMJM’s design came from the concept of energy in water – the site is located on the city’s main waterway the River Neva, with the form of the building deriving its shape from the changing nature of water, ever changing light, reflections and refraction. The five-sided tower twists as it rises to delicately touch the sky. The announcement comes on the day that RMJM opens its first office in Moscow. The practice was awarded the prestigious City Palace Tower contract in the country’s capital city earlier this year as well as ongoing high-quality leisure, residential and commercial projects across Russia. These activities have raised the company’s profile and led to the decision to put down more permanent roots in Moscow. It takes the firm’s total number of offices worldwide to 11. The St. Petersburg Union of Architects refused to be involved in the Gazprom Design Competition. The majority of St Petersburg residents appear to be not in favour of the tower. Kisho Kurokawa, who is working as an architect on a major project in St. Petersburg, Norman Foster and Rafael Vinoly resigned from the Gazprom Competition jury before the announcement following viewing of the shortlisted tower designs. All three architects resigned from the jury.